Vinyl decals have been around a long time, most commonly used in advertising, but with the increased popularity of vinyl being used for decorating purposes now there is much confusion on the difference between printed vinyl decals and cut vinyl decals. Both mediums will produce stunning decals for decorating purposes however there are some differences and those differences may determine which kind of decal you want for your decorating project. Let's explore those differences below. As you can see on the picture below, before installation, the differences between the two are very subtle. The differences will become more noticeable during and after installation. PRINTED VINYL is much easier to install and will closely resemble what you think of as a "peel and stick" sticker. Printed vinyl is basically what it sounds like, inks are used to print a design onto clear or white vinyl and because of that, printed vinyl can produce a decal that has many multiple colors. Printed vinyl can also produce a photo realistic decal. CUT VINYL takes a little more time and patience to install, but once installed it can appear to be hand painted. Cut vinyl decals have no background, the background that you see behind the cut vinyl design is what you install it onto. 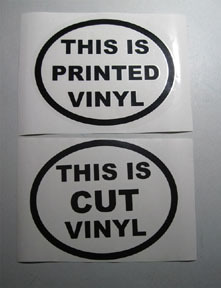 Cut vinyl decals are die-cut from pre-colored rolls of vinyl and because of that you are limited by color selection. Cut vinyl CAN produce a decal using multiple colors, however, each color in the design must be a different layer, and because more materials are used for each layer, it can quickly become very expensive to do this. 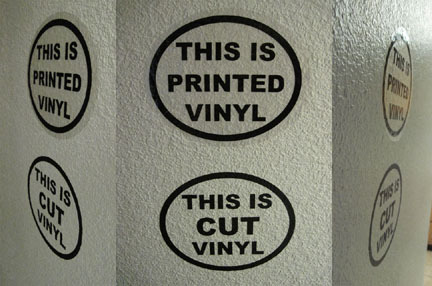 Here is a good analogy to use when comparing cut vinyl to printed vinyl. Say you have a flower design, red flower, green leaves and yellow centers and when you print that design it comes out all at once on one sheet of paper, just like a printed decal would. Now if you want to create that same design using colored construction paper you have to cut out the shapes from the correct colors of construction paper and then assemble them to get the same flower design, just as a multi-color cut vinyl decal would have to be. Content copyright 2010-2015 ThunderStorm Graphics. All rights reserved. These terms and conditions outline the rules and regulations for the use of ThunderStorm Graphics's Website. By accessing this website we assume you accept these terms and conditions in full. Do not continue to use ThunderStorm Graphics's website if you do not accept all of the terms and conditions stated on this page. This Walls That Talk website is operated by ThunderStorm Graphics. Throughout the site, the terms “we”, “us” and “our” refer to Walls That Talk a division of ThunderStorm Graphics. Unless otherwise stated, Walls That Talk owns the intellectual property rights for all material on ThunderStorm Graphics website. All intellectual property rights are reserved. The ThunderStorm Graphics website, Walls That Talk designs and original artwork are copy written and forbidden to be copied, redistributed, sold or published in whole or in part without written permission. Walls That Talk does not claim ownership of the quotes and sayings on this website. They are what we believe to be in the public domain for public use. If any are found to be copy written, they will be immediately removed. The information contained on ThunderStorm Graphics website is for general information purposes only. ThunderStorm Graphics assumes no responsibility for errors omissions in the contents on the Service. To the extent that the website and the information on the website are provided free of charge, we will not be liable for any loss or damage of any nature. ThunderStorm Graphics reserves the right to make additions, deletions, or modification to the contents on the website at any time without prior notice. ThunderStorm Graphics reserves the right to update or modify these Terms and Conditions at any time without prior notice. Your use of this website following any such change constitutes your agreement to follow and be bound by the Terms and Conditions as changed. For this reason, we encourage you to review these Terms and Conditions whenever you use this website. Walls That Talk customers assume responsibility in determining product suitability for intended use. Walls That Talk, a division of ThunderStorm Graphics, shall not be liable for any direct, indirect or consequential damages, arising from the use or the inability to use the products we sell. Surfaces to which the material will be applied must be smooth, non-porous and thoroughly cleaned from dust, grease, or any contamination. Freshly painted or lacquered surfaces should be allowed to stand for at least three weeks to complete curing. The compatibility of paints and lacquers should be tested before use. This warranty is declared in lieu of any other claim, whether expressed or implied, and is not subject to interpretation. THE WALLS THAT TALK WEBSITE IS OPERATED BY THUNDERSTORM GRAPHICS, ON AN "AS IS," "AS AVAILABLE" BASIS, WITHOUT REPRESENTATIONS OR WARRANTIES OF ANY KIND. TO THE FULL EXTENT PERMITTED BY LAW, THUNDERSTORM GRAPHICS, DISCLAIM ANY AND ALL REPRESENTATIONS AND WARRANTIES WITH RESPECT TO THIS SITE AND ITS CONTENTS, WHETHER EXPRESS, IMPLIED, OR STATUTORY, INCLUDING, BUT NOT LIMITED TO, WARRANTIES OF TITLE, MERCHANTABILITY AND FITNESS FOR A PARTICULAR PURPOSE OR USE. WITHOUT LIMITING THE FOREGOING, THUNDERSTORM GRAPHICS DOES NOT REPRESENT OR WARRANT THAT THE INFORMATION ON THIS WEBSITE IS ACCURATE, COMPLETE, RELIABLE, USEFUL, TIMELY OR CURRENT OR THAT THIS WEBSITE WILL OPERATE WITHOUT INTERRUPTION OR ERROR. THUNDERSTORM GRAPHICS DOES NOT ENDORSE NOR MAKE ANY WARRANTIES OR REPRESENTATIONS ABOUT THE OPTIONS OR OTHER SERVICE OR DATA YOU MAY ACCESS, DOWNLOAD OR USE AS A RESULT OF THE USE OF THE INFORMATION CONTAINED ON THIS WEBSITE, OR ABOUT ANY WEBSITE YOU MAY ACCESS THROUGH THIS WEBSITE. LINKS TO OTHER SITES ARE PROVIDED FOR CONVENIENCE ONLY. YOU NEED TO MAKE YOUR OWN DECISIONS REGARDING YOUR INTERACTIONS OR COMMUNICATIONS WITH ANY OTHER WEBSITES. THUNDERSTORM GRAPHICS MAKES NO REPRESENTATION THAT CONTENT PROVIDED ON THIS WEBSITE IS APPLICABLE OR APPROPRIATE FOR USE IN LOCATIONS OUTSIDE OF THE UNITED STATES. THUNDERSTORM GRAPHICS ASSUMES NO RISK OR RESPONSIBILITY FOR YOUR USE OF ANY OF THE CONTENT PROVIDED ON THIS WEBSITE. UNDER NO CIRCUMSTANCES, SHALL THUNDERSTORM GRAPHICS OR ANY OF ITS EMPLOYEES, DIRECTORS, OFFICERS, AGENTS, VENDORS OR SUPPLIERS BE LIABLE FOR ANY DIRECT OR INDIRECT LOSSES OR DAMAGES ARISING OUT OF OR IN CONNECTION WITH THE USE OF OR INABILITY TO USE THIS WEBSITE. THIS IS A COMPREHENSIVE LIMITATION OF LIABILITY THAT APPLIES TO ALL LOSSES AND DAMAGES OF ANY KIND (WHETHER GENERAL, SPECIAL, CONSEQUENTIAL, INCIDENTAL, EXEMPLARY OR OTHERWISE, INCLUDING, WITHOUT LIMITATION, LOSS OF DATA, INCOME OR PROFITS), WHETHER IN CONTRACT, NEGLIGENCE OR OTHER TORTIOUS ACTION, EVEN IF AN AUTHORIZED REPRESENTATIVE OF THUNDERSTORM GRAPHICS HAS BEEN ADVISED OF OR SHOULD HAVE KNOWN OF THE POSSIBILITY OF SUCH DAMAGES. APPLICABLE LAW MAY NOT ALLOW THE LIMITATION OF LIABILITY SET FORTH ABOVE, SO THIS LIMITATION OF LIABILITY MAY NOT APPLY TO YOU. IF ANY PART OF THIS LIMITATION ON LIABILITY IS FOUND TO BE INVALID OR UNENFORCEABLE FOR ANY REASON, THEN THE AGGREGATE LIABILITY OF THUNDERSTORM GRAPHICS UNDER SUCH CIRCUMSTANCES FOR LIABILITIES THAT OTHERWISE WOULD HAVE BEEN LIMITED SHALL NOT EXCEED ONE HUNDRED DOLLARS ($100). BY ACCESSING AND USING THE THUNDERSTORM GRAPHICS WEBSITE, YOU AGREE THAT YOUR ACCESS TO AND USE OF THIS WEBSITE IS SUBJECT TO THESE TERMS AND CONDITIONS, AS WELL AS ALL APPLICABLE LAWS, AS GOVERNED AND INTERPRETED PURSUANT TO THE UNITED STATES OF AMERICA. Content copyright 2018 ThunderStorm Graphics. All rights reserved. Content copyright 2018 ThunderStorm Graphics.